An increasing number of countries are now implementing or planning to implement labourbased road construction and maintenance programmes. 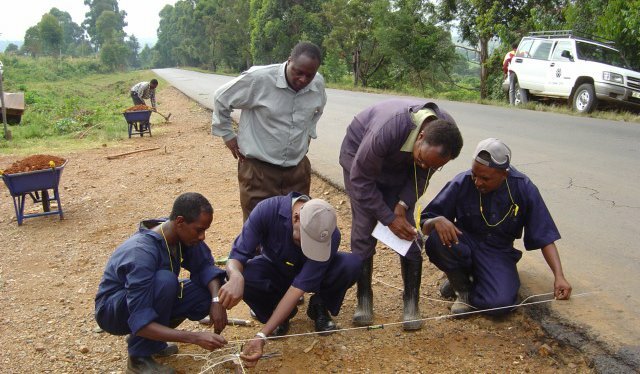 Kisii Training Centre (KTC) organises annual International Training Courses to pass information and experiences on to engineers, technicians, contractors and trainers from all over Sub-Saharan Africa and the rest of the world. Who would be in a better position to train than KTC? The experience of Kenyans in labour-based road works goes back to 1967. KTC is directly responsible for road construction and maintenance activities in the area, and as a direct consequence of this, everything, which is taught in the classrooms can be exercised and tested immediately on the site. For purposes of teaching theory, KTC has fully equipped classroom facilities in the modern training centre built with the assistance of the Swiss Agency for Development and Cooperation. The lecturers and instructors at KTC are experienced labour based practitioners. ILO/ASIST assures the quality of the courses besides adding further international experience. However we expect participants to be teachers on their part. Both the trainers and the course participants can learn from each other on what is happening in other countries. KTC continues to build bridges between individuals and continues to build bridges between individuals and countries in the entire sub-Saharan Africa region and beyond.